Most parents aren't used to hearing their 5-year-olds shout, "More vegetables, please!" But we want to change that! Since we don't live in an ideal world, we've combed the blogosphere to find a few seemingly successful strategies to help climb the uphill battle that is getting our kids to eat more veggies. As parents, what have you found that works with your kids? Photo and recipe by Snixy Kitchen. Bake Zucchini into Muffins. Cinnamon-y goodness. Cauliflower Macaroni & Chesse? Please. Cauliflower chocolate cake. Okay, okay, twist our arm. We'll take a piece. Photo and recipe by Rabbit Food for my Bunny Teeth. Photo by Simple Green Smoothies. Speaking of, the ladies at Simple Green Smoothies are so much more than smoothies! They've suggested many ways you can get your kids to learn more and be more familiar with vegetables, rather than just sticking their noses up at the word "vegetable." Their recommendations? Easily accessible veggies and fruits, and letting them pick out fruits and vegetables at the farmer's market and grocery store, among others. Read more here. These are only a few ways out there to get those vegetables onto kids' plates and into their mouths. As parents, what have you found that works with your kids? Comment below! National Asparagus Festival - This Weekend! The 42nd annual National Asparagus Festival is THIS weekend! The event is held in Oceana County, Michigan, and has a plethora of asparagus-themed activities. The 2015 Asparagus Queen, Courtney Kokx, and runner-up, Konnie Vandervelde, were crowned last weekend. They will be representing royalty at this weekend's festival and promoting Michigan Asparagus. Want to know more about what an Asparagus Queen does? Click here. Don't miss this amazing event that supports local farmers, Michigan agriculture and Michigan asparagus! For all of the event details, visit www.nationalasparagusfestival.org. Who will be the 2015 Asparagus Queen? We are less than two weeks away from the National Asparagus Festival, held on June 12-14th in Oceana County. But before that, we must name a queen! Saturday, June 6th, will mark the fate of one lucky girl, as she is crowned the 2015 Asparagus Queen. Candidates, Konnie Vandervelde and Courtney Kokx, are vying for the 2015 crown. Both are no strangers to asparagus royalty. Danielle Kokx, the 2014 Asparagus Queen (and candidate Courtney Kokx's sister), and Gina Ferweda (left), a resort owner and food blogger, on Fox 17 Morning Mix. Vandevelde's great-aunt, Lorena, was the 1993 Asparagus Queen and Kokx's sister, Danielle, was reining queen in 2014, making it a close race with royal bloodlines throughout! Candidates, Courtney Kokx and Konnie Vandervelde, compete for the 2015 Asparagus Queen crown. The pageant crowned its first queen in 1975 and has made dreams come true for asparagus-loving ladies ever since. Each year, the National Asparagus Festival (NAF) hosts a pageant and formal dinner where the Asparagus Queen of the country is crowned. Once named, the newly appointed asparagus queen will travel the state of Michigan promoting the asparagus industry in Oceana County and encouraging Michiganders to support our local agriculture industry. "All of the exposure and support goes straight back to the farmers that produce this wonderful vegetable that we're known for," says the NAF. The National Asparagus Festival's Banquet and Pageant is held this Saturday, June 6, at 6 p.m. at Shelby High School. Tickets are $12 and sold online or at the door. The formal event will include dinner (with plenty of options for non-asparagus lovers), music, and entertainment. Is Asparagus the Latest Superfood? We've always known that asparagus has amazing health benefits, like being a great source for folic acid, vitamin B6, and fiber, and is low in calories and fat. But do these health-packed spears possess enough super qualities to be the next-named superfood? According to an article by Expand Your Consciousness, they do! These powerful attributes, among others, pack a big punch with this green vegetable. And it's in season NOW in Michigan until mid-June. So do we really need to give you any more reason to go out and BUY NOW? Asparagus stalks should be firm. If you were to bend it, it should feel like it’s going to snap in half. Look for tips that are closed tightly together. Bright green, smooth, straight stalks with dark green or purple tips. Along with tight closed tips, the best pick should have a shade of dark green or purple. This is more for convenience, rather than an indicator of flavor. Thicker stalks simply mean they’re more mature. 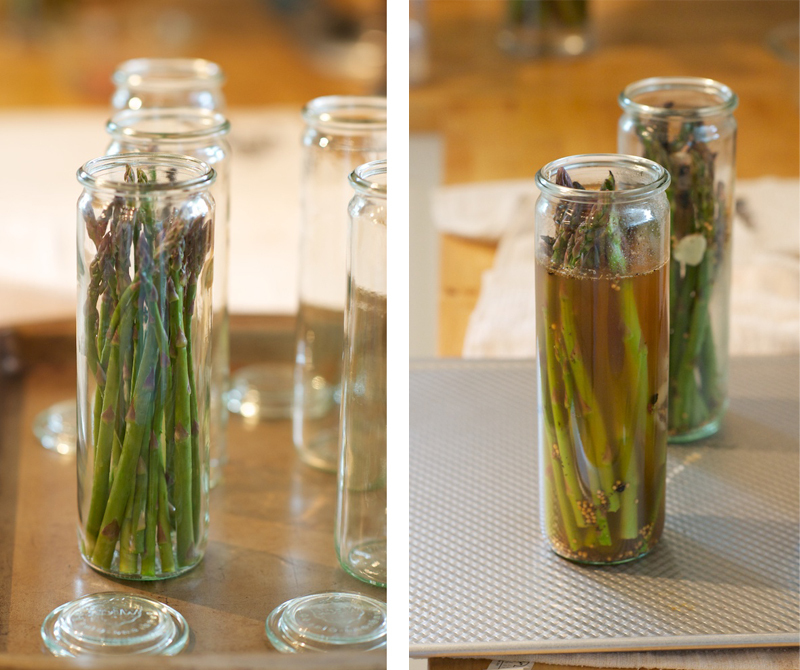 No matter small or large, a consistent diameter will help the asparagus cook evenly. When you squeeze the bunch together, it should squeak. This indicates the firmness and freshness of the bunch.